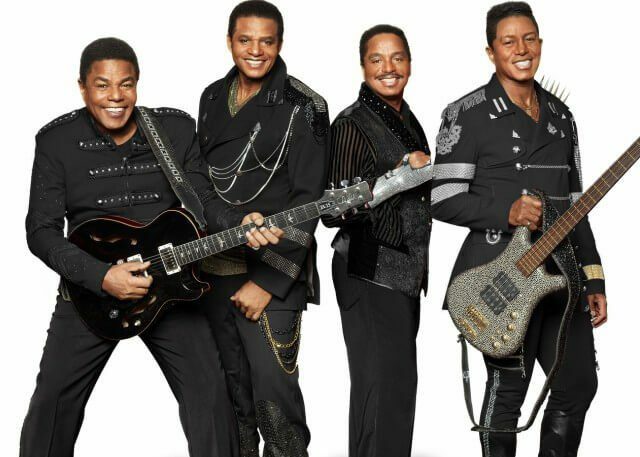 The Jacksons are quite possibly the most well-known family of musical artists on the planet. Initially put together by Jackie, Tito and Jermain in the early 60s, it was not long before Marlon and Michael joined the band. After a string of live performances, their unique talent was noticed by Motown Records, who signed them up in ’68. Making history as the first ever group to debut with four consecutive No. 1s, they soon became Motown icons, not least for their choreographed shows and costumes. With instantly recognisable hits ‘I Want You Back’, ‘ABC’, ‘The Love You Save’, and ‘I’ll Be There’, they have been entered into the Rock and Roll Hall of Fame, to be remembered as one of the most influential super groups ever. In total, this legendary outfit boasts sales of 100 million records worldwide, 5 No. 1 albums, 18 No. 1 singles, 17 top 10 albums and 17 top 40 singles. Their breathtaking list of world tours has seen them play in Japan, Hawaii, South America, Hong Kong, Australia, New Zealand and the Philippines, to name but a few. Their shows have also been frequented by British royalty, namely Queen Elizabeth during their 1972 tour of Europe. Today, attendees of their live shows can expect moving tributes to their superstar brother, Michael Jackson, with renditions like ‘Rock With You’, ‘Wanna Be Startin’ Somethin’ and ‘Can’t Let her Get Away’.